Mani Caffe is a newly opened coffee shop in the Carnival Park below the Big Wheel in Mihama. It is a clean bright place with potted plants and plenty of seating space outside on the deck or on its own balcony, with a fine view of the bright lights of Mihama. Its main difference to other coffee shops is the choice of six types of syrup to flavor the coffee: vanilla, coconut, caramel, Bavarian, hazlenut and Irish cream. Mr Arakaki, who started the café says he has confidence in the uniqueness of the syrup because once added to coffee it makes the drink pleasant for people who usually don’t even like coffee. This sounds like a sales gimmick, but truth to tell, one of DG’s companions, who sampled a Mani coffee with him, is not normally a coffee drinker but said she enjoyed the concoction. It was served with a frothy top decorated with a heart shape in sprinkled brown powder. Arakaki confesses he was one of the ranks of those not interested in or knowledgeable about coffee until a short time ago. He sampled an espresso and first became interested in the phenomenon at the end of last year. He was running an on-base kindergarten and one of the parents of a child who attended there, ran a chain of base cafes called Seattle Express. The popularity of these establishments and his friendship with their owner, Robert, gave him the idea of starting a similar chain outside the bases. Robert has since returned to the USA. At the end of January this year Arakaki traveled to the United States to study the business of running a coffee outlet. He learnt how to make coffee and mastered the complexities of machine maintenance. Robert, who now runs a Mani Caffe chain in the U.S., put him in touch with all the contacts he would need for a crash course in café management. Arakaki says his wife has long had a dream of running a café. He thought one of the obvious pitfalls of turning the dream into a reality would be opening a place which had trouble attracting repeat customers. The location he did choose is a very busy and popular spot and there was competition from other businesses wanting to open there. Arakaki successfully persuaded the Carnival Park proprietors to lease it to him. His wife now serves behind the counter at Mani’s. Since he opened the café in July he has had offers to open branches in such prestigious outlets as Jusco department store and the airport. The Expresso Straight part of the coffee menu offers Expresso at ¥250 and Con Panna and Macchiato at ¥300. The Espresso Coffee menu has Americano, Café Latte, Capuccino and Café Mocha in regular or large sizes, hot or cold. Prices range between ¥350 and ¥480. They come with the six choices of syrup. There are also milk shakes in raspberry, mango, peach, blueberry, cappuccino and chocolate flavors, ¥380 for a regular and ¥430 for a large one. In addition a Mani Special Sundae costs ¥550. Other drinks available are cola, ginger ale, calpis, iced tea, orange and grapefruit juice and cocoa. They cost from ¥300 to ¥380 regular and ¥350 to ¥400 large. Mani’s snacks are Panini or sandwiches. There are choices of chicken at ¥650 or roast beef at ¥680. They are garnished with herbs and served in unleavened bread rolls. They are also available with salad servings at ¥750 and ¥780. DG sampled both types of panini which were tasty and filling. He also indulged in the tempting Chiffon cake, laden with cream and cranberries. Mani Caffe is open from 11.30 am to 12 pm, with last orders at 11.30 pm. 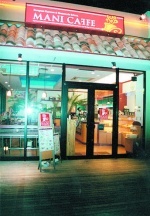 Arakaki aims to have a chain of Mani Caffes, first on the island, then branching into mainland Japan. He thinks now is a good time to get into this business, as international chains like Starbucks are dithering about opening here. By the time they have made up their minds, he hopes to have a well-established niche market in Okinawa.